New AMI database available of German injection moulders. AMI has recently updated its comprehensive database to give detailed information on injection moulding companies in Germany. The result of this research is two new up-to-date guides (split into Northern Germany and Southern Germany) detailing more than 2,300 injection moulding companies. This represents a net 5% loss in companies compared with three years ago when AMI last surveyed the market. Altogether nearly 250 injection moulding businesses have gone from AMI’s databases. Over 60% of these have either gone because of insolvency or because of transferring moulding operations to Eastern Europe or China. A number of companies have ceased to exist because of the retirement of owners or because of plant rationalisations or mergers. The remaining companies still exist but have withdrawn from injection moulding preferring to contract out their moulding requirements or have refocussed their activities on tooling, assembly or finishing operations or moved into non-plastic activities. Further bankruptcies and rationalisations can be expected through 2009. In March 2009 Plastal, one of Germany’s largest moulders, filed for bankruptcy. Formerly known as Dynamit Nobel Kunststoff it was acquired in 2005 by the Swedish group Plastal, itself owned by private equity firm, Nordic Capital. In Germany Plastal operates four injection moulding plants. Other moulders, still operating, but which were declared insolvent during include Geiger Technologies and Schenk Plastic Solutions. These companies too were owned by private equity investment. Schenk Plastic Solutions was eventually acquired mid- 2008 by the Indian group Ashok Minda. Although private equity and foreign ownership is increasing within injection moulding the sector remains dominated by small, privately owned or German-owned business. Only around 10% of the businesses listed in AMI’s database are part of larger international groups or owned by private equity funds. Reliant on funding from local banks many small and medium-sized moulders are struggling to raise capital in the current difficult economic environment. injection moulders in AMI’s database using it. PP is widely used for automotive, household and packaging applications. 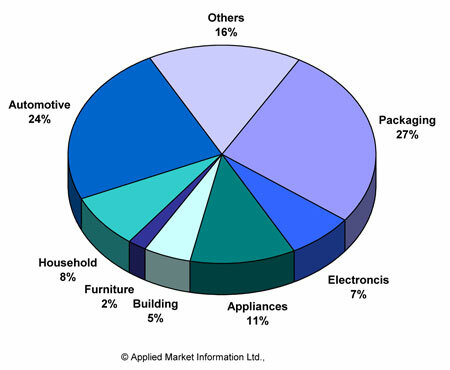 The largest market served by moulders is the packaging industry which accounted for 27% of polymer usage in 2008. Germany also has a particularly large moulding industry serving the automotive industry. Although this was estimated to have accounted for 24% of demand in 2008 this was down over 10% compared with the peak reached in 2007. These figures are a just a small abstract from the wealth of information available. The new guides provide a valuable insight into Europe’s largest injection moulding market whilst detailing information on polymers used and markets supplied by company. Comprehensive information on services offered, machinery and polymer consumption is also listed.